1. the anterior or superior part of a structure or organism. 2. in vertebrates, the part of the body containing the brain and the organs of special sense. Called also caput. articular head an eminence on a bone by which it articulates with another bone. head injury traumatic injury to the head resulting from a fall or violent blow. Such an injury may be open or closed and may involve a brain concussion, skull fracture, or contusions of the brain. All head injuries are potentially dangerous because there can be a slow leakage of blood from damaged blood vessels into or around the brain. Such a process will gradually increase pressure within the skull and compress the surrounding brain (see hematoma). One of the most common complications of head injury is subdural hematoma, resulting from the oozing of blood from the cortical veins and the small blood vessels that lie between the arachnoid and the dura mater. A less common but more serious complication that constitutes an extreme surgical emergency is epidural hematoma, a collection of blood in the space between the skull and the dura mater. 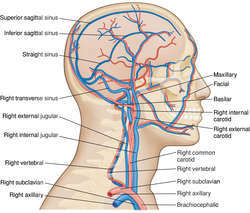 The leaking of blood into the epidural space is the result of the rupture of a large meningeal artery. It progresses rapidly and therefore requires immediate treatment. A third complication that may occur following head injury is herniation of either the brainstem or a part of the cerebellum through the tentorial hiatus (transtentorial herniation). This is an extreme emergency demanding immediate relief of pressure against the blood vessels serving the brain stem and cerebellum. Long-term effects of head injury include chronic headache, disturbances in mental and motor function, diabetes insipidus, and a host of other symptoms that may or may not be psychogenic. Organic brain damage and posttraumatic epilepsy resulting from scar formation are possible sequels to head injury. Treatment. The method of treatment will depend on the kind and amount of damage inflicted on the brain and surrounding membranes. Surgical procedures to relieve intracranial pressure include the drilling of burr holes in the skull to aspirate accumulated blood, and intracranial surgery to remove hematomas. Edema of brain tissue may be reduced by the intravenous administration of mannitol. dexamethasone(Decadron), a steroid antiinflammatory agent that has little salt-retaining action, is often used. If no immediate surgery is indicated, the physician may choose to treat the head injury conservatively, with rest and quiet and the careful monitoring of the patient for signs of change in the neurologic status. Patient Care. Continuous monitoring of the vital signs and assessment of the patient's neurologic status are essential to the care of the patient with a head injury. Fluid intake and output are measured and recorded and are limited according to the degree of edema present. Intravenous fluids must be given with caution and oral liquids allowed as soon as the patient is able to swallow. An excessively large urinary output is reported immediately, as this may indicate damage to the hypothalamus and suppression of antidiuretic hormone. Any one of the following symptoms should be reported to the physician: (1) changes in the patient's blood pressure, pulse, or respiratory rate, especially slowing of the pulse with a rising blood pressure; (2) extreme restlessness or excitability following a period of comparative calm; (3) changes in the level of consciousness; (4) headache that increases in intensity; (5) vomiting, especially persistent, projectile vomiting; (6) unequal size of pupils; (7) inability to move one of the extremities; (8) leakage of spinal fluid (clear yellow or pink-tinged) from the nose or ear. When leakage of spinal fluid is suspected, this can be verified by using a Clinistix test for sugar. If it is positive, the leaking fluid is spinal fluid rather than mucus. When there is leakage of spinal fluid through the nose, the patient must be warned not to blow the nose. Leakage of spinal fluid from the nose or the ear demands absolute bed rest with the head elevated 30 degrees to maintain neutral intracranial pressure and promote healing. Patients who are unconscious must be watched closely for respiratory difficulty or inability to swallow. If the patient cannot swallow, the head must be turned to the side and the mouth and trachea suctioned as necessary to prevent aspiration of mucus into the lungs. A tracheostomy set and ventilator should be readily at hand in case severe respiratory embarrassment occurs. Side rails are applied and the headboard of the bed is padded with pillows or a blanket if the patient is delirious or if convulsions are anticipated. An accurate record of the patient's intake and output is kept and the patient is observed for signs of retention of urine, incontinence, or abdominal distention. Some mechanisms of head injury. Head injury results from penetration or impact. A, A direct injury (blow to skull) may fracture the skull. Contusion and laceration of the brain may result from fractures. Depressed portions of the skull may compress or penetrate brain tissue. B, In the absence of skull fracture, a blow to the skull may cause the brain to move enough to tear some of the veins going from the cortical surface to the dura. Subsequently, subdural hematoma may develop. Note the areas of cerebral contusion (shaded in red). 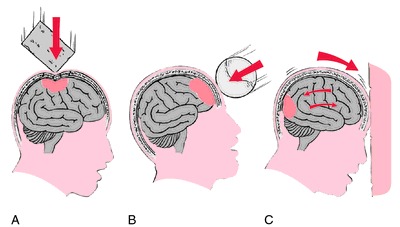 C, Rebound of the cranial contents may result in an area of injury opposite the point of impact. Such an injury is called a contrecoup injury. In addition to the three injuries depicted, secondary phenomena may result from the injury and cause additional brain dysfunction or damage. For example, ischemia, especially cerebral edema, may occur, elevating intracranial pressure. From Polaski and Tatro, 1996.
sperm head (head of spermatozoon) the oval anterior end of a spermatozoon, which contains the male pronucleus and is surrounded by the acrosome. See illustration at spermatozoon. 1. The upper or anterior extremity of the animal body, containing the brain and the organs of sight, hearing, taste, and smell. 2. The upper, anterior, or larger extremity, expanded or rounded, of any body, organ, or other anatomic structure. 3. The rounded extremity of a bone. 4. That end of a muscle that is attached to the less movable part of the skeleton. (hed) caput; the upper, anterior, or proximal extremity of a structure, especially the part of an organism containing the brain and organs of special sense. h. of muscle the end of a muscle at the site of its attachment (origin) to a bone or other fixed structure. 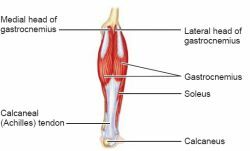 Lateral and medial heads of the gastrocnemius muscle. 1. The uppermost or forwardmost part of body of a human or other vertebrate, containing the brain and the eyes, ears, nose, mouth, and jaws. 2. The analogous part of an invertebrate organism. 3. The pus-containing tip of an abscess, boil, or pimple. 4. The proximal end of a long bone. The end of a muscle that is attached to the less movable part of the skeleton. 1 the uppermost extremity, containing the brain, special sense organs, mouth, nose, ears, and related structures. Most of the tissues are enclosed within the skull, composed of 28 bones. At birth the head is about half the size of an adult head; the greatest changes after infancy involve growth of the facial area. 2 a rounded, usually proximal portion of some long bones. a specialty in medicine concerned with the anatomical, physiological, and pathological characteristics of the head, eyes, ears, nose, and throat and with the diagnosis and treatment of disorders of those structures. 2. The larger extremity of any organ. An abnormal fixation of the head may be caused by postpharyngeal abscess, arthritis deformans, swollen cervical glands, rheumatism, traumatism of the neck, sprains of cervical muscles, congenital spasmodic torticollis, caries of a molar tooth, burn scars, or eye muscle imbalance (hyperphoria). An inability to move the head may be due to caries of the cervical vertebrae and diseases of articulation between the occiput and atlas or paralysis of neck muscles. Abnormal movements of the head include habit spasms such as nodding. Rhythmical nodding is seen in aortic regurgitation, chorea, and torticollis. A retracted head is seen in acute meningitis, cerebral abscess, tumor, thrombosis of the superior longitudinal sinus, acute encephalitis, laryngeal obstruction, tetanus, hydrophobia, epilepsy, spasmodic torticollis, strychnine poisoning, hysteria, rachitic conditions, and painful neck lesions at the back. Childbirth with the head delivered last. A projection on bone that articulates with another bone. 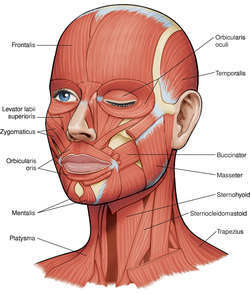 the upper or front part of the body in vertebrates, that contains and protects the BRAIN, eyes, mouth, nose and ears when present. There is usually a concentration of sense organs in the head, such as eyes, tentacles, antennae and mouth parts. The head has probably developed because of forward locomotion, as a well-developed head is absent in organisms lacking unidirectional movement (e.g. sea urchin). the corresponding part of an invertebrate animal. See also CEPHALIZATION. the foremost part of a sperm cell containing the ACROSOME. 1. [TA] Upper or anterior extremity of animal body, containing brain and organs of sight, hearing, taste, and smell. 2. [TA] Upper, anterior, or larger extremity, expanded or rounded, of any body, organ, or other anatomic structure. 3. Rounded extremity of a bone. 1. the anterior or superior part of a structure or organism, in vertebrates containing the brain and the organs of special sense. See also skull, caput. 2. one animal; used in reference to farm livestock, e.g. ten head of cattle. an eminence on a bone by which it articulates with another bone. the patient is unable to keep the head still while at rest, it makes an involuntary, usually at regular intervals, short, quick downward movement then recovers. of spermatozoon, formed by the collapse of the acrosomial vesicle over the nucleus. includes at attention, drooping, rotated, deviated. a leather halter-like piece of harness consisting of a poll strap, nose band and usually a rope shank. hood or cap used by surgical personnel to reduce contamination of the surgical area by hair and associated flora. the poll-nose axis is turned laterally so that the animal walks in circles but there is no disturbance of balance. Occurs in lesions of the neck and of the cerebral cortex. the fetal head is deviated laterally to lie against the shoulder of the fetus, the front feet and the lateral aspect of the neck being presented to the pelvic inlet; a dystocia which can only be relieved by repulsion of the fetus and the return of the head to between the front feet. the head of the fetus is flexed ventrally so that the fore feet and the dorsum of the neck are presented to the pelvic inlet; a dystocia which can only be relieved by repulsion of the fetus and lifting of the head into the pelvic canal. jaundice, photosensitization and hepatic injury in lambs caused by Narthecium ossifragum poisoning. traumatic injury to the head resulting from a fall or violent blow. Such an injury may be open or closed and may involve a brain concussion, skull fracture, or contusions of the brain. a form of cannibalism in which birds pick at and injure each other's wattles, combs, eyes; beak trimming reduces the problem but does not prevent the vice. persistent pushing with the head against a fixed object. Part of the dummy syndrome as in hepatic encephalopathy or encephalitis. the elongating cephalic tissues which represent the first step in the development of the fetal body. twisting of the head around the axis from the poll to the nose. To be differentiated from deviation of the head. 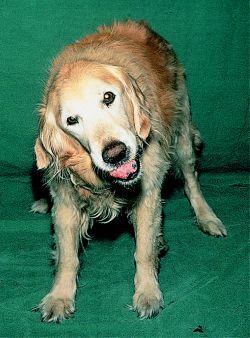 Caused usually by lesions of the vestibular apparatus on one side. The animal walks in circles and has problems maintaining its balance. common in dogs and cats with acute inflammation or foreign bodies in the external ear canal. May be a cause of auricular hematoma. Seasonal head shaking is seen in horses mainly during spring, worsening in summer. A trigeminal neuritis caused by increased levels of melatonin is the suspected cause in some. Allergic rhinitis may also be an underlying cause. said of a horse that tries to avoid having its head handled or its headstall put on. a feature of cerebellar lesions. injury to cervical vertebrae may occur in horses as a result of a fall with the head and neck under the body. in acupuncture the zones of human skin which are responsive to abnormalities in each of the vital organs. Q. What is the cause of my head rash? I have a rash on my head. It is red and itchy, what could it be from? Q. Head aches terrible I am suffering with bad headaches everyday for the past week, so i thought i would check up on it from you guys. When the day nears the noon, my head ache becomes worse. No common cold. Kindly give me a solution. A. Anyone who suffers from headaches knows they can put a damper on everyday life. But not all headaches are alike. Learn what type of headache you have. Q. Why do they think that the pain is all in my head? Is there any chance which may wrongfully lead doctor to conclude that our symptoms are of a psychological nature? Why do they think that the pain is all in my head? A. It may happen very rarely and if he is new to his profession. It doesn’t mean that all those are new to their profession does these mistakes. Doctors cannot "see" and may not understand the sources of your pain or fatigue. However, what they do observe is your anxiety and frustration with having to deal with these symptoms around-the-clock, which may wrongfully lead them to conclude that your symptoms are of a psychological nature. Also, the old school of thought regarding pain is that it is produced by tissue injury, and there is no obvious source of tissue injury in patients with fibromyalgia. Regardless, if your doctor does not believe that your symptoms are real, you owe it to yourself to find another doctor who believes in you and will work with you to help reduce your symptoms.